Keep in mind that at the time this site was built most people had never even heard of the Internet never mind the concept of an online catalog! This site was ahead of it's time and may have even been one of the very first online catalogs ever on the Internet. 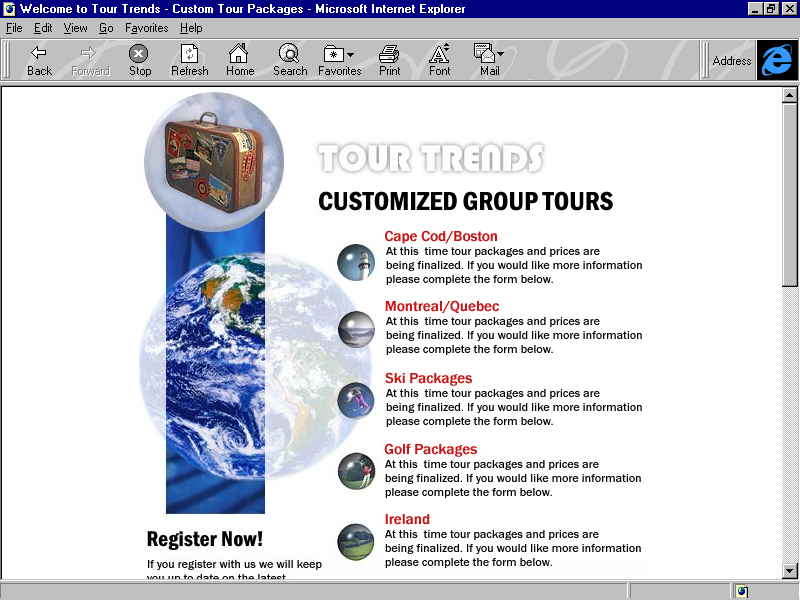 Several years after I created the Linray Super Fitness site I started working on several other sites with a group of folks at InDigit Technologies Inc. One of the first sites I created was small site for a local New England tour operator called Country Squire Tours. Nothings elaborate but at the time the design was quite nice. I decided to include this site here due in part that the Saturn brand is now long gone and it's nice to have worked with them while they were still around. The design was not as exciting as other sites I did but the feel was bang on for what Saturn was looking for. The concept and design ended up being the prototype for other later Saturn web site designs so I guess it ultimately was "mission accomplished". 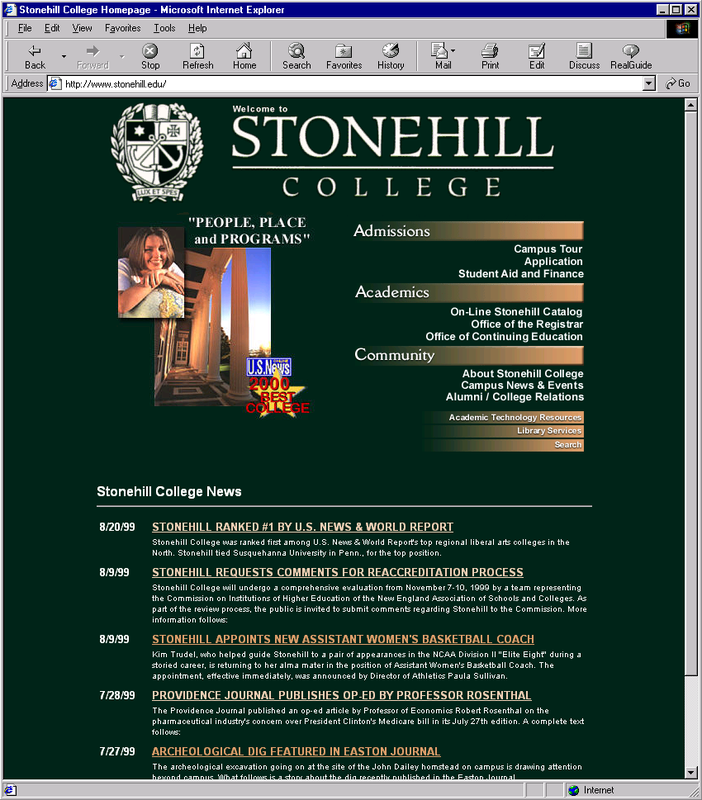 By far one of the largest web design jobs I have had the opportunity to work on, the complete re-design of the Stonehill College web site was extremely challenging. 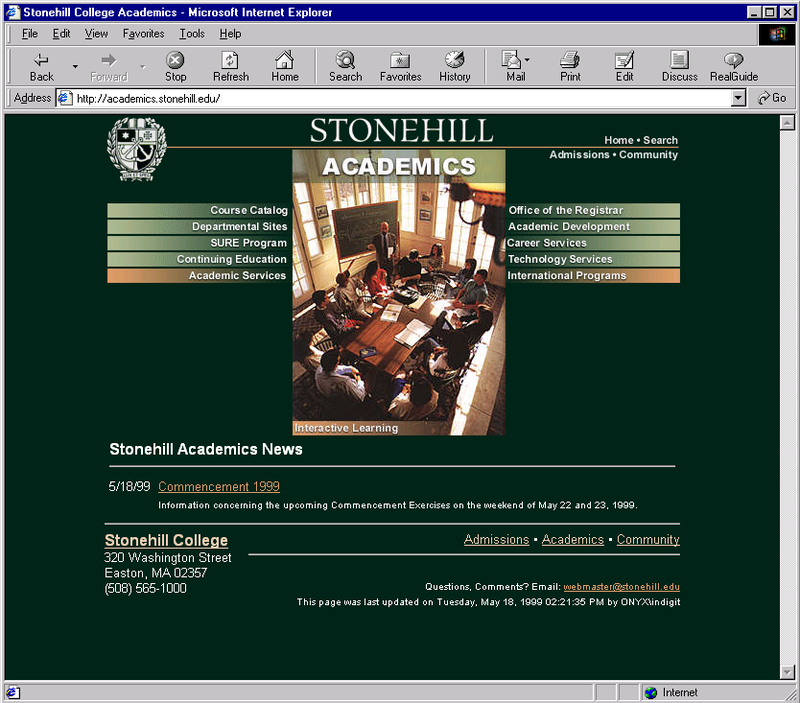 This site was a complete technological make-over using the latest in web technologies (at the time). Unfortunately I ended up learning a valuable lesson while working on this project. For a variety of reasons, Microsoft Visual Interdev (Active Server Pages) was selected as the core development environment for the majority of the interactive components. At first things went rather well and the technology worked more-or-less as expected. However as the project progressed and the technological demands increased problems cropped up. It was at this point that Microsoft announced they were moving away from Interdev to the much more complex, and yet unproven, Visual Studio. This essentially left us in the un-enviable position of trying to complete a complex project while explaining to the customer that the technology used was already obsolete. Lesson learned. I have never relied on single-vendor sourced technology since for the design and maintenance of any mission critical web site. An interested site, and one of the first where I designed and deployed a back-end database solution. The basic concept was to capture information for folks to sign up for the dental plan and then use the database to maintain things going forward. The site worked great but the plan they were offering never really seemed to take off. A large, static content site for the popular Red Jacket Inns resorts located on Cape Cod and other popular New England areas. I personally loved the design of this site because it featured magazine-style layouts and high quality photos throughout the entire site. Modeled after the printed promotional materials, both the site and brochure matched and presented a nice clean marketing front for each of the resorts. This was one of my favorite designs, simple yet fun. 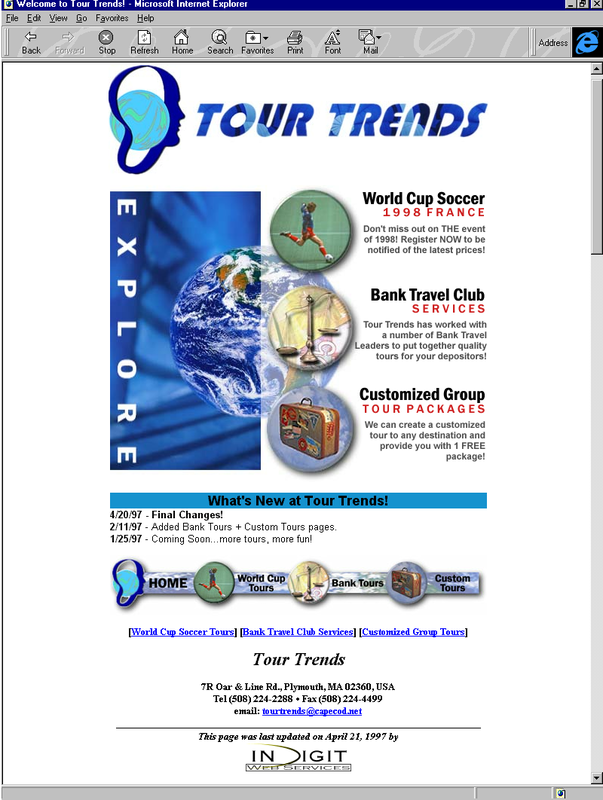 The tour operator was really big into the World Cup Soccer event so the design was centered around that theme. If memory serves, I believe the site design was created in one session and the total turn around to the customer was less than one week. A nice classic design and a fast back-end database for home listings made this site stand out. Back in 2000 not a ton of realtors were online and there was no Zillow yet so this site was very well received. The ability for the Davenport Realty staff to add listings in realtime was a huge win that set them apart from the local competition.